Lake banned, Petrie cleared Nat Edwards brings you all the latest news from the Tribunal. 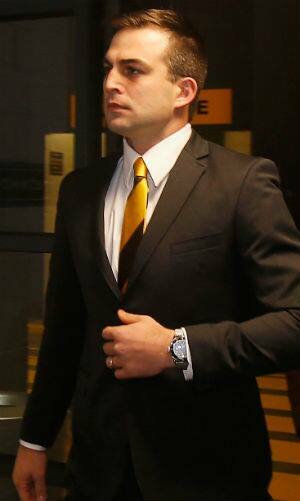 HAWTHORN defender Brian Lake has been found guilty of misconduct at the Tribunal on Tuesday night and will miss four matches for his choker hold on North Melbourne forward Drew Petrie. In a controversial case that sparked much debate, Lake was sent directly to the Tribunal to answer a charge of forcefully applying his hand to Petrie's throat where there was a risk of serious injury. He pleaded guilty to a lesser charge of rough conduct – "aggressive wrestling" – and argued he was not applying pressure to Petrie's throat but rather grabbing at his opponent's jumper. In a marathon hearing, the jury of David Neitz, Richard Loveridge and Wayne Schimmelbusch deemed his offence to be worth 410 points, inclusive of a 10 per cent loading for his bad record. An emotional Lake spoke after the hearing and said he respected the jury's decision. "It's been a tough couple of days for myself and my family, it's just great to come here and get my point across on what happened," he said. "I respect the jury's decision on the four weeks and I've just got to look forward to a tough four-week period of training and getting my body right. "Leading into finals I've got three weeks (after the ban ends) to get my match fitness and look for a big September." Earlier on Tuesday night, Petrie faced the Tribunal and escaped suspension for making contact to Lake's face as the pair grappled. The Kangaroos forward, who was pinned to the ground by Lake, told the Tribunal he "needed to push out of that position for my own safety". Lake, who was condemned by his coach and teammates for the offence, faced the Tribunal second and disputed the allegation he made forceful contact to Petrie's throat. Under questioning from his own legal counsel, Chris Townsend QC, he said he pushed down on his opponent's shoulder and grabbed at his jumper to prevent Petrie's hand coming back at his face. Talking through the vision under questioning from AFL counsel Andrew Woods, Lake said he acknowledged Petrie was in "discomfort" but he had made an effort not to make high contact for fear of giving away a free kick. The jury took five minutes to uphold the allegation of forcefully applying his hand to Petrie's throat in circumstances where there was risk of serious injury. Chairman Ross Howie then instructed the jury on coming to an appropriate penalty, saying it was relevant for the jury to consider Lake had pleaded guilty to an aspect of rough conduct. "It's a measure of responsibility on his part," Howie said. AFL counsel Woods submitted the base penalty should be 300 demerit points, with a 10 per cent loading and Lake's 37.5 carryover points taking the total to 367.5 points. The jury took six minutes to arrive at the more severe penalty of 410 points, inclusive of Lake's 10 per cent loading for his bad record but not including his 37.5 carryover points. The Norm Smith medallist will miss matches against Adelaide, the Sydney Swans, the Western Bulldogs and Melbourne.